The Restaurant serves delectable dishes from across the world. It is the only restaurant in Agra where you can relish wood fired pizzas with a selection of the best combinations. Savour cuisine from the Mughal era as our chefs recreate authentic recipes, or enjoy the varied flavours of Europe and Asia, if you are in the mood for some culinary globetrotting from the comfort of your dining chair. 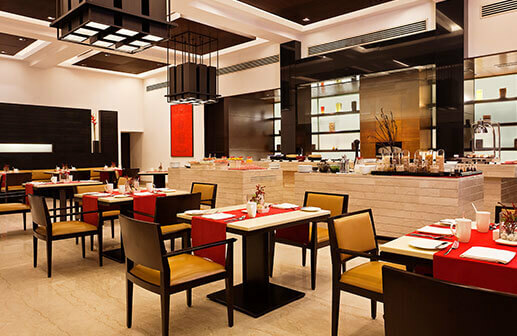 Every meal is a memorable dining experience at The Restaurant at Trident, Agra. Our thin crust pizza with Italian pomodori pilati sauce and mozzarella, topped with fresh basil. Warm up your winter evenings with live grills by the poolside. Delight your taste buds with an elaborate menu, cooked to perfection right beside your table. Select from a wide variety of meats and vegetables well marinated and served with a choice of accompaniments. Spice up your Sunday Brunch and tantalize your taste buds with myriad flavours from Indian and Western Grills, live counter for Dosa, Chaat and Pasta, with a choice on a range of drinks.